This course teaches IT Professionals how to manage their Azure subscriptions, including access, policies, and compliance, as well as how to track and estimate service usage and related costs. Students also learn how cloud resources are managed in Azure through user and group accounts. Students learn how to grant appropriate access to Azure AD users, groups, and services through Role-based access control (RBAC). Students also discover the core monitoring tools and capabilities provided by Azure, including Azure Alerts and Activity Log. Students are then introduced to Log Analytics as a broad data analytics solution and use this service to query and analyze operational data. Students then learn about the Azure Resource Manager deployment model, and how to work with resources, resource groups and ARM templates. 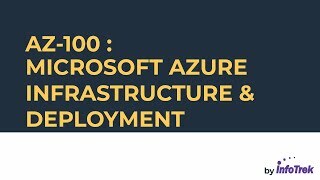 Because this course is the first course in the series for the Azure Administrator exams, there is a considerable amount of foundational content that is covered here in order to prepare students for the remaining courses in the curriculum. So, students are provided with a lesson that covers tips and tricks for working in the Azure portal, as well as an introduction to key tools used in the Azure environment, such as the Cloud Shell and Resource Explorer. Emphasis is laid on PowerShell and the command line interface (CLI) as important skills to acquire not only in preparation for the exam but for the job role itself. •	Manage Azure subscriptions and billing and implement Azure policies. •	Implement access management with Azure users, groups, and role-based access control. •	Use Azure Monitor to configure Azure alerts and review the Azure Activity Log. •	Query and analyse Log Analytics data. •	Deploy resources with ARM templates and organize Azure resources. •	Create Azure storage accounts for different data replication, pricing, and content scenarios. •	Implement virtual machine storage, blob storage, Azure files, and structured storage. •	Secure and manage storage with shared access keys, Azure backup, and Azure File Sync. •	Store and access data using Azure Content Delivery Network, and the Import and Export service. •	Monitor Azure storage with metrics and alerts, and the Activity Log. •	Explain virtual machine usage cases, storage options, pricing, operating systems, networking capabilities, and general planning considerations. •	Create Windows virtual machines in the Azure Portal, with Azure PowerShell, or using ARM Templates. •	Deploy custom server images and Linux virtual machines. •	Configure virtual machine networking and storage options. •	Implement virtual machine high availability, scalability, and custom scripts extensions. •	Backup, restore, and monitor virtual machines. •	Understand virtual networking components, IP addressing, and network routing options. •	Implement Azure DNS domains, zones, record types, and resolution methods. •	Configure network security groups, service endpoints, logging, and network troubleshooting. •	Implement Azure Active Directory, Self-Service Password Reset, Azure AD Identity Protection, and integrated SaaS applications. •	Configure domains and tenants, users and groups, roles, and devices. •	Implement and manage Azure Active Directory integration options and Azure AD Application Proxy. •	Query and analyze Log Analytics data. •	Optimize your use of Azure tools like the Azure portal, Azure PowerShell, Cloud Shell and the Azure CLI. In this module, discover how a shared access signature (SAS) can be used to provide delegated access to resources in storage accounts, allowing clients access to those resources with sharing the storage account keys. You’ll also learn how to use Azure backup as a cloud-based solution for an existing on-premises or off-site backup and data protection solution. This module also covers Azure File Sync as a way to centralize an organization’s file shares in Azure Files and using Windows Server to cache the Azure file share locally, thus enabling scenarios such as “lift and shift,” backup and disaster recovery, and file archiving. In this module, you will learn how to create custom virtual machines in Azure. For example, deploying a server image that is in your on-premises datacentre. You will also learn how to create and connect to Linux virtual machines. •	Implement site connectivity schemas including VNet-to-VNet connections and virtual network peering.